Yours Truly Photography is Santa's favorite photographer! We’ve been in the business for years and know what parents love about Santa photos. We move quickly, and keep lines relatively short. High speed lab quality printers to produce our prints and pruducts on-site in just a few minutes. Immediately after your photo is taken, the photo card below is printed for you - with your santa photo in the samples! This makes it wasy to see how your photos will turn out. We're a local business, with local business prices. Any Santa package is just $18. Get two packages for $30. Additional packages are $10. Virginia 5.3% Sales Tax is included in our prices. We accept cash, check, and all major credit cards. Our packages make sense. We're parents too, and we know that most of us don't need a zillion prints. Purchase just what you need. 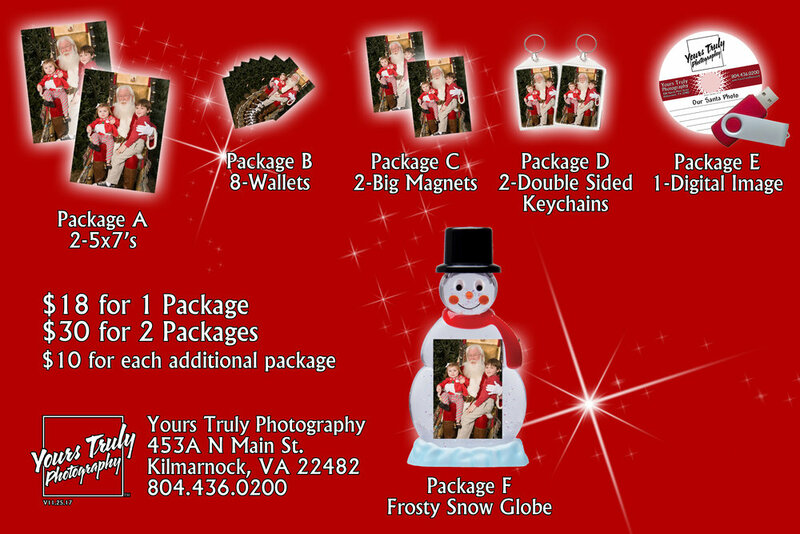 Trust Yours Truly Photography for your Santa Experience this year! Packages may vary slightly as demand for certain products affect inventory.